Wednesday night I had a company dinner and so arrived home late. When I got home, my oldest boy was complaining of tummy problems and quickly dashed to the bathroom. When he came out, he was red faced and clammy with watery eyes. In short,he looked really bad. So we talk about how he feels and he tells me that his tummy really hurts. And then he says "May I be excused?" and of course we say yes and he says "I have to go throw up." It goes on until about 4am, and this is where I have to admit something. OMG I lay there in terror, in between the vomit, hoping that he didn't sit up and puke all over me. Some moms get all barfed up and they must have Teflon skin - not me. I cannot STAND it. I mean - I'm THERE for him, wiping his mouth, giving him a drink to rinse and spit.....getting towels, giving hugs. Oh GOD please don't puke on me. He wanted to snuggle up and lay on me and that just kept me awake even more. I could hear every gurgle of his tummy, every moan in his sleep even better and I'm a ball of tension - don't barf on me please don't barf on me. The next morning he bounces out of bed completely excited and off we went to school - he was feeling great and I chalked it up to something he ate. (Of course by then I'm not feeling go at all). Of course the school called a few hours later. They had 150 kids have to go home due to vomiting and mine was one of them. The board of health showed up and they've closed the school because it's more than 10% of the school population. All I know is - nobody barfed on me, and that is all good. 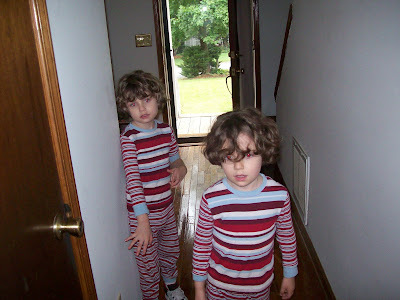 I leave you with a pic of the twins, on pajama day. One Christmas, I was holding a 3-year-old Jeannette and she barfed all over my shoulder and back. Like a technicolor fountain of yack. It even went down my shirt and into my bra. Thankfully, it was at Barbara's house, although I'm sure Barbara was not as happy about that as I was!